Forager joins Australian super funds in Vienna’s international airport. 2017 could be the year for unlocking value in two long-held investments. Why 2017 is likely to see us wield our influence more aggressively. New investment Silver Bay Realty is already subject to takeover offer. The Forager team were hoping for a quieter year in 2017. The first three months have been anything but. Every Christmas I reflect on the hectic year that was and imagine that the following year is going to be different. There won’t be any new funds to launch. There won’t be any separation from Intelligent Investor taking up our time. There won’t be any funds listing on the ASX. I see myself lying on the couch in the corner of Forager’s office. Some nice music playing in the background, feet up and annual report in hand. Alas, it never seems to work out that way. And if the first three months is anything to go by, 2017 is not going to be any different. The year has begun with a flurry of attempted takeovers in both portfolios, reporting season left us with a wide array of headaches and opportunities, and surging prices for some of our key holdings are creating when-to-sell dilemmas. The year had barely begun when CIMIC launched a takeover offer for Macmahon, one of the Australian Fund’s largest investments. Formerly known as Leighton Holdings, CIMIC is ultimately controlled operationally and financially by Spanish construction company ACS (it’s a byzantine structure that the Europeans seem to do best, whereby Madrid-listed ACS owns 72% of Frankfurt listed Hochtief which in turn owns 73% of ASX-listed CIMIC, but the Spanish are very clearly in control). Following successful takeovers for Sedgman and UGL and an unsuccessful attempt at Devine, CIMIC has developed a reputation for aggressive takeovers and the Macmahon bid followed the previously-successful playbook (bid a healthy premium but immediately declare it final and unconditional, meaning there is no wriggle room to raise the price and they are happy to take whatever stock they can get). I’m not really sure what is meant by aggressive in the context of a takeover. Someone offers to buy your shares and you choose whether you want to accept the bid or not. Nobody hurled abuse at me or challenged me to a bull fight. Prior to the offer CIMIC’s advisor called me and, without stating why, asked my thoughts on the value of the company. I told them $0.15-$0.20. An hour later they bid $0.145 and I didn’t hear from them again. Someone offers to buy your shares and you choose whether you want to accept the bid or not. Nobody hurled abuse at me or challenged me to a bull fight. I wasn’t surprised by the bid price and presumably they weren’t surprised that we didn’t accept it. You can read further details in the Australian Fund section below but this saga is far from over. 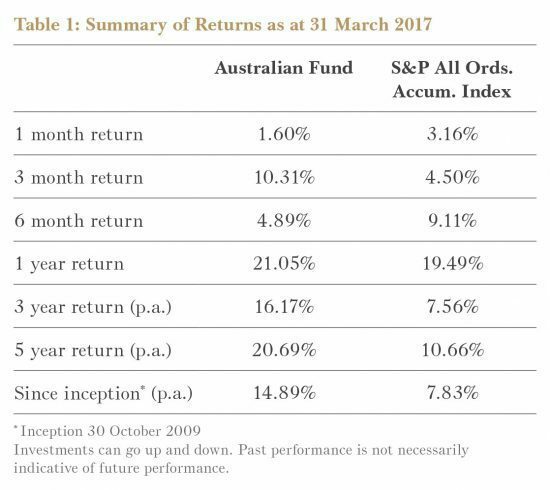 It’s going to be fundamental to the Australian Fund’s returns over the next year or so. On the other side of the world we received another underwhelming bid. Canadian company Tricon bid US$21.50 for NYSE-listed Silver Bay Realty. Until you read Gareth’s summary of the situation below, you probably won’t know much about this residential property trust. That’s because we were still in the process of adding to our holding and the stock is relatively illiquid. Unlike Macmahon, we won’t have much of a say in whether this bid is successful or not (Forager controls less than a percent of Silver Bay). But we’re happy to lend support to anyone else who wants to play a defensive role and, given the share price is trading slightly above the offer price, that’s not out of the question. We bought this stock fully expecting it to be taken over, taken private or liquidated at some point. The costs of managing residential property and being listed were chewing up a disproportionate amount of attractive yields at the property level. But the bid is earlier and lower than we would have liked, especially given very strong signs of a robust residential property market in the US. We would prefer to hold out a year or two and will be doing what we can fight off the current bid. That we are getting takeover offers for our stocks won’t surprise Forager’s earlier investors. It has been a common occurrence since we commenced and is one of the most important ways we can bridge the gap between our estimate of a company’s value and the price at which we purchased them. Today’s backdrop, however, is one of limited opportunities to reinvest our capital. 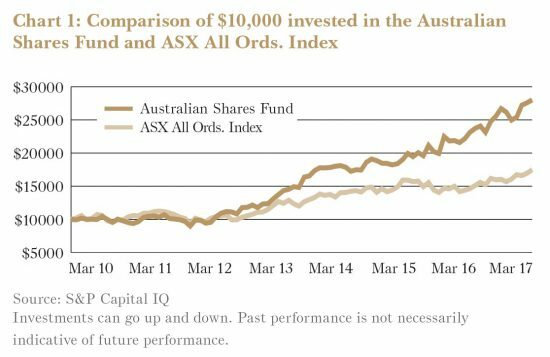 In March last year I wrote about the dramatic discrepancies between expensive growth stocks and ASX-listed blue chips. Comparing Whitehaven Coal to Bellamy’s, the pockets of extreme value were obvious. Those expensive stocks have come back to earth and the cheap lower-quality businesses have seen their share prices rally. This leaves us with a much more level playing field. Getting the most out of our existing holdings is therefore even more important than usual. That means making sure that takeover offers represent the full value of what we own. It also means encouraging those companies not subject to takeover offers to take the steps required to crystallise underlying value for shareholders. As you’ll read in this report, we own a number of stocks with obstructed value either on the balance sheet or embedded in the structure. Size as a fund manager doesn’t confer many advantages, but one is the ability to influence the direction and strategy of the business in which we own shares. Over calendar year 2017 you will see us attempt to put that influence to good use. Then there are the stocks that we bought at attractive prices that today are looking fully valued. These stellar performers cause us as many conundrums as any. A purchase price of eight times earnings isn’t cheap enough for a poor quality business. And 20 times can be a bargain for a business that keeps growing. In Australia Service Stream is the main angst provider. The stock is up six-fold since 2014 but it keeps delivering wonderful results and the directors keep buying shares, even at today’s prices. Two of our favourite European companies, El.En and B&C Speakers, have been a pleasure to own, with profits and dividends constantly exceeding our expectations. But, since January 1 2016, the share prices of these two companies are up 174% and 57% respectively. We hate generating tax bills for investors. For the global stocks, selling also crystallises any foreign exchange gain during the period of ownership. And I have a general view that most value investors don’t spread their arms wide enough when it comes to valuing stocks. A purchase price of eight times earnings isn’t cheap enough for a poor quality business. And 20 times can be a bargain for a business that keeps growing. We’ve been agonising over these decisions for some time now but share prices have kept on rallying. Keeping the above caveats in mind, as many Australian growth stock investors can attest, owning an overpriced good business is just as risky as owning an overpriced poor one. So, unfortunately, we are going to be sending investors in both funds more tax bills. In addition to tax bills, realisation means finding new ideas in which to deploy the cash. As I said earlier, the playing field has levelled out. And most investors I talk to are bemoaning the lack of attractive investment opportunities. But that has been the case for the past few years now and attractive investments have kept turning up. Gareth, Kevin and I attended a value investing conference in Spain in late March and watched 18 fund managers pitch their favourite ideas. A number of them looked prospective, and we’ll do some work to decide whether we want to piggy back on their ideas. More importantly, it shows that the ideas are out there – it is just going to take some work to find them. The year 2017, then, is shaping up as another busy one. Truth be told, we wouldn’t have it any other way. For those who can’t attend, we are planning to produce a webinar version which can be accessed any time. Please keep an eye on Forager communications and the website for webinar dates. Although correlated, investing success isn’t directly defined by rising share prices. This quarterly report outlines a few winners, losers and some we can’t categorise until more time passes. How much am I going to get? When am I going to get it? How certain am I? The trick is to focus on situations where you can answer these three questions accurately, buy with an appropriate margin of safety, and you don’t need to worry about much else. The share price can go up down or sideways. It doesn’t even matter whether the shares trade at all. The business you own is going to provide you with the return you require. Despite knowing this, despite repeating it ad nauseam to investors and potential investors alike, we still get lured into letting share prices define success. Sotheby’s (NYSE: BID) share price has doubled since we bought it, therefore we were right. Countrywide (LSE: CWD) is down 60% over the past few years, therefore we stuffed it up. We paid $22 a share for Sotheby’s and sold it only eight months later for $40 a share. While that sounds great, the test is whether it delivers the anticipated cashflow stream or not. Since our purchase Sotheby’s has returned about $6 to shareholders in the form of dividends and buybacks. That’s meaningful progress but it has some proving to do yet. We won’t know for five or ten years whether our purchase price was a wonderful investment or whether we were lucky. Countrywide, on the other hand, has recently cut its dividend and undertaken a capital raising. Rather than paying cash out, they are asking shareholders to put more in. Further down the path than Sotheby’s, it’s clear we have this one wrong. Not because the share price is down, but because the cashflows are a long way short of our expectations. The more time that passes, the more evidence you get to assess the original investment case. Which brings us to an old favourite, B&C Speakers (BIT: BEC). This Italian speaker manufacturer has been in the portfolio since 2013. The original purchase price was €4.10 per share. In the four years since, earnings per share have grown from €0.38 to €0.58 and the dividends have followed. In total we have received €0.99 in dividends and in late March the company declared another €1, including a €0.60 special dividend. 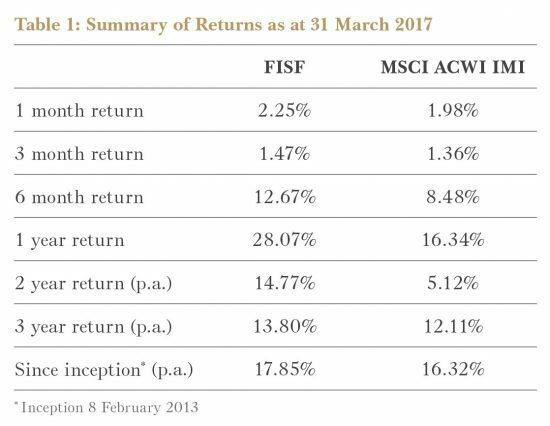 Once paid, the Fund will have received 49% of its original purchase price back in cash. The underlying dividend represents a yield of 10% on purchase price and it should grow from here. The share price is up 195% since that initial purchase, closing at €12.10 at the end of the quarter. Would we care if it was still trading at €4.10? No. We own a business that is delivering wonderful returns on our initial outlay. That is the true test of a successful investment. Management tells us we were the first fund managers ever to visit B&C’s head office outside Florence. Even the Milanese financial community, a short high-speed train ride away, didn’t bother. The CFO, Simone Pratesi, shared a pizza with us in the company’s cafeteria. “You guys have the easiest job in the world” he told us. “All you need to do is invest in B&C and go to the beach while I make you rich”. Now onto a new investment, both a success and a mistake. A mistake because we bought with a thimble, rather than a shovel, only managing to take a 2% position when it should have been double that. Flughafen Wien AG (WBAG:FLU) owns the monopoly international airport serving Vienna, Austria. It’s European analyst Gareth Brown’s local airport and an asset we know well. The company also owns half of the fast-growing but smaller Malta International Airport. Last time we discussed the company, we lined Vienna up against Zurich Airport (see June 2013 Quarterly Report). The Fund bought Flughafen Zürich (SWX:FHZN) and profited handsomely before selling out last year. You would have done a touch better if we’d opted for Flughafen Wien instead. The stock more than doubled mid-2013 to late-2016. But the company was also paying down debt over that period, so the rise in enterprise value was less pronounced. The Fund bought Flughafen Wien shares in November 2016 on a free cash flow yield of roughly 7-9%. That's several percentage points too high in comparison with similar airports elsewhere. Meanwhile, the management team installed in 2011 continued to grind out improvements and earned trust. Coffee-less enclaves became rarer. The number of security gates consolidated. Departing travellers were ‘treated’ to a meandering pathway through duty free. The price of Coca-Cola in vending machines seemingly tripled overnight. Higher end stores appeared. Those changes added meaningfully to profit margins and cash flow. That trend should continue. The group will invest €500m between 2018 and 2023, refurbishing one of the terminals, centralising security for the entire airport and (most importantly) increasing retail and gastronomy space by almost 50%. Once through security, passengers will soon be able to access all parts of this retail extravaganza, in contrast to today where you are shunted down to isolated peninsulas. In 2013 we were concerned management would pull the trigger too soon on construction of a third runway. That has been pushed out by the economic realities of larger planes and the environmental concerns of Austrian courts (surprisingly not noise, but carbon dioxide emissions). The earliest it could be operational is now 2030 and that’s dependent on the Austrian Constitutional Court. The delay is positive. In 10-15 years, this investment might make more compelling sense. 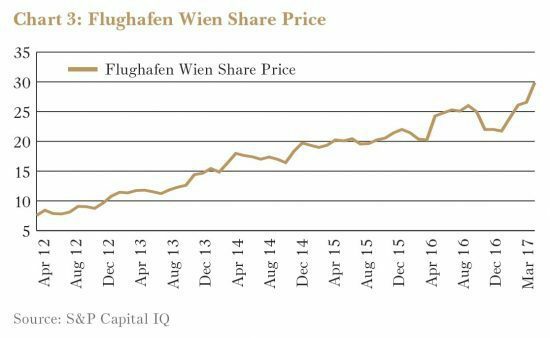 Depending on how you make certain adjustments, the Fund bought Flughafen Wien shares in November 2016 on a free cash flow yield of roughly 7-9%. That’s several percentage points too high in comparison with similar airports elsewhere. Cash flow will grow nicely in the years ahead. In a world of low interest rates and correspondingly high prices for infrastructure assets, how could Flughafen Wien shares be priced so attractively? In a word, liquidity. The company has long been 40% owned by regional governments with a further 10% held by an employee trust. The free float (shares available to the investing public) was 50% back in 2013. Then IFM Investors—an amalgam of various Australian industry super funds—bought aggressively via several tender offers and now owns 38% of the company. That leaves a free float of just 10-12% (barely a few hundred million euros’ worth). Most institutional investors have sold and brokers ceased coverage. We picked up their scraps. Confident of the long-term outlook, we’re becoming more excited about shorter term prospects too. Passenger growth across Europe has picked up sharply in recent months —see Bristlemouth post Europe Takes Off from 15 February 2017. Each monthly release from October 2016 to the latest in February 2017 reported annual passenger growth at Vienna north of 5% (after adjusting February for the 2016 leap day). That’s the quieter half of the year and might not herald a sustainable trend. But management’s 2017 forecast of 0-2% passenger growth looks conservative. Airports are a leveraged bet on passenger growth. So it’s not a surprise the stock is up 34% since our purchase. We only wish we’d been quick enough to buy more. Two of the Fund’s most important investments, Lotto24 (DB:LO24) and JRP Group (LSE:JRP), recently reported results suggesting the investment case for both is progressing well. Nothing in Lotto24’s 2016 result was surprising. The German online lottery ticket retailer added 399,000 new customers for the year, compared to 361,000 in 2015. The cost of acquiring each customer fell by a few euros. And thanks to a healthy year of jackpots, average spend per active customer was €685, but even that was only a 2.7% increase on the previous year. What, then, explains the 81% appreciation in the share price during the 2016 year? The one meaningful surprise is that Lotto24 is keeping a larger percentage of ticket sales for itself. Our original expectations were for a 9% cut. It kept almost 10% in 2015, 11.3% in 2016 and management says the 2016 level is sustainable. More importantly, investors seem to be waking up to the fact that Lotto24’s financial statements are substantially underplaying the value being created. We estimate each new customer is worth more than €120 to Lotto24, perhaps as much as €150. The roughly 400,000 new customers, then, has added something like €50m of value to the company during the year. Yet it still reports accounting losses because the customer acquisition costs are all booked upfront, whereas the revenues are generated over many years. In 2017, revenue from the 1.3 million existing customers will cover Lotto24’s fixed overheads and the cost of acquiring another 350,000 or so new ones. By 2018 it should generate some healthy free cashflow and, without doing anything different, the cash will continue to grow from there. That is more apparent to other investors today than it was two years ago, hence the share price appreciation. It is still cheap and still an important investment for the Fund but the holding has been reduced in parallel with the margin of safety. While the signs are also encouraging, it is early days for our newer investment in UK annuities provider JRP Group (see the December 2016 Quarterly Report). For the 2016 full year JRP recorded a pre-tax profit of £164m, up 58% on a poor 2015. It increased the full year dividend to 3.5p and management painted a particularly optimistic picture for the years ahead. Regulatory changes have caused significant headaches during the past few years. Until 2014, all members of a UK defined benefit superannuation scheme were forced to convert their superannuation into an annuity on retirement. When this gravy train ended and retirees were given more choice, two thirds of them chose not to take an annuity, decimating JRP’s business. Those headaches look to be a thing of the past. Sales have stabilised and the latest regulatory changes should allow JRP to increase its market share. Established pension providers like Prudential (LSE:PRU) have historically used their position as scheme provider to flog their own annuity products, sometimes at significantly worse prices than the market rate. The UK regulator is now forcing them to offer a panel of competitors’ products and, as the largest and most competitive independent, JRP is set to feature prominently. Management is telling shareholders that this improved environment should show up in margins rather than top line sales. As long as this flows through to the bottom line, it should be good news for shareholders. Whether investment success is defined as a cash flow stream developing to thesis, or share price appreciation, Sabre Corp. (Nasdaq:SABR) was a mistake. The stock is down 16% on our purchase price two years ago. Our investment rationale rested on two tenets. First, that Sabre’s Travel Network segment was a high-quality, defensible business underappreciated by the market due to perceived threats from competition. Our view was largely substantiated. It has maintained a strong position in corporate travel, picked up market share in some regions and generated profits aplenty. Second, we felt that the company’s rapidly growing software business would enable Sabre to grow profits at an accelerated pace without the need for a significant increase in costs. Fast forward two years and results here have not evolved as expected. While the software division revenue has grown, profit margins have slipped. Whether investment success is defined as a cash flow stream developing to thesis, or share price appreciation, Sabre Corp was a mistake. We would be willing to give the company more time if not for recent developments. Sabre’s new CEO warned of an upcoming period of significant investment. Unfortunately, this investment is aimed at updating the company’s existing systems and technology, not the type required for winning new business. The CEO painted a picture of a company falling behind in its maintenance, a message that surprised us. After re-doing the numbers, we sold our investment. In late February, Canadian group Tricon bid for Silver Bay at $21.50 cash per share - a 28% premium to the Fund's average purchase price. 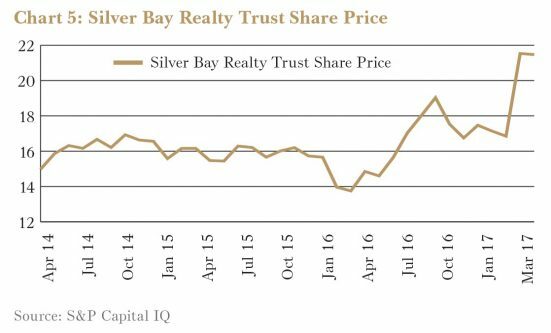 Six months ago the Fund invested in US real estate investment trust Silver Bay Realty (NYSE:SBY), owner of 9,000 detached homes in large, fast-growing southern US cities bought at bargain prices during the real estate bust. Up significantly since the nadir, the estimated market value for these houses even today—just US$165,000—might buy you a granny flat in Australia. What kind of house does US$165,000 buy in the US? A surprisingly nice one – typically built in the mid-1990s with 3-4 bedrooms, 2 bathrooms and on a large block. Located in a reasonable neighbourhood in suburbia 10-30 miles from downtown and rented to a family for US$1,200 per month. Vacancies are barely 3%. Acquiring land and building something similar today would cost much more – in the lingo these houses trade well below replacement cost. That sets up an interesting tailwind. Undersupply in entry-level houses is evident in many markets in the US, with sales inventories plumbing all-time lows. For cost-related reasons, few homebuilders bother building cheaper single family houses today. Real estate markets across the US have been inflating meaningfully since crisis lows. Unsurprisingly, this cheaper end of the market has been rising faster still. The asset base and tailwinds were interesting enough. But what made investing compelling was the more than 25% discount to net asset value (NAV) at the time of purchase. Larger single family REITs were trading at or above NAV. It was an opportunity to buy houses in 2016 at 2012 prices. The end game was always likely a takeover. Scale matters in the rental business and there are bigger fish that could make better use of these assets. In late February, Canadian group Tricon bid for Silver Bay at $21.50 cash per share—a 28% premium to the Fund’s average purchase price. That price is at the lower end of fair. Directors plan on accepting in the absence of a higher offer, which is a chance of materialising. For now, though, we’re invested in bricks and mortar. The Fund’s proportional share of Silver Bay equates to indirect control of 47 American homes – 15 in Atlanta, 7 in Phoenix, 6 in Tampa and the rest in similar, fast growing southern cities. By law, the Fund must distribute all income and realised capital gains to investors each year. Most investment funds opt to do that in a single distribution on 30 June, ours included. This year, though, we’ve had a buoyant market plus some individual success. It has led to a greater than usual amount of selling of profitable investment positions over the year so far. We’ve lightened our positions in big winners Lotto24 and El.En (BIT:ELN). As highlighted in previous letters, over the past 9 months we’ve profitably sold out of South32 (ASX:S32), Sotheby’s (NYSE:BID), Harley-Davidson (NYSE:HOG), eBay Inc. (Nasdaq:EBAY) and others. More recently the Fund sold out of Cable ONE Inc. (NYSE:CABO), delivering a 44% return in barely a year. The cable services provider recently agreed to acquire smaller competitor NewWave Communications, and the deal looks like a winner. We expect Cable ONE will improve NewWave’s business meaningfully. Other investors seemed to agree. Feeling like the current price accurately allowed for that upside, we exited our position. It’s hard to complain about investments working out well and quickly, but the consequence for investors will be a bigger than usual distribution this year. Rather than save it all for 30 June, the Fund paid a 10-cent special distribution on 4 March 2017. Depending on your stated preferences, you should have received cash in your nominated bank account or have had the proceeds automatically reinvested in new units in the Fund. The Fund will make another distribution effective 30 June. As per usual, tax statements will be sent mid-July. The statement will outline the various tax categories of both the March and June payments. While it can be easy to identify the value locked inside a business, the ultimate success of an investment depends on whether value can be extracted for the benefit of shareholders. Value investing is all about identifying a company whose shares are trading on the stockmarket at a significant discount to their intrinsic value. Calculate the value of the underlying business, subtract any debt and divide the result by the number of shares on issue. Compare this value per share to the share price and buy when the gap between the two is significant. Or so the theory goes. In practice, value investors (including ourselves) often get trapped in companies with significant underlying value that perennially trade at a discount to that value. That happens because the assets are not really worth what we think they are worth, or because the value doesn’t get returned to shareholders and management misallocates resources at low or negative rates of return. 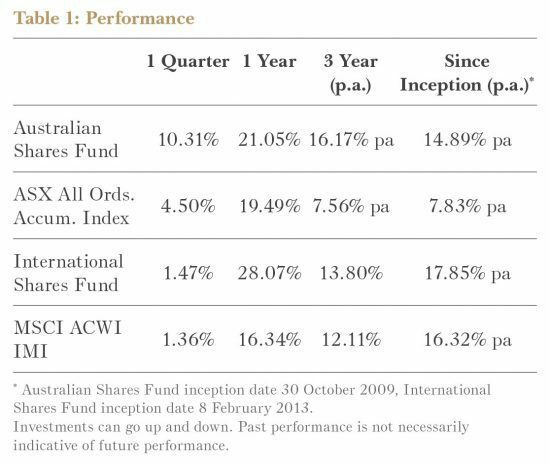 In the Forager Australian Shares Fund, not getting trapped is going to be particularly important over the coming year or so. In a buoyant market where attractive opportunities are becoming less prevalent, realising the value underlying some of the key holdings is going to be fundamental to overall returns. Already this year the Fund has rejected a bid from CIMIC Group (CIM) for its Macmahon (MAH) shares. Macmahon is the perfect example of a company sitting on a lot of assets that hasn’t been able to convert their value into returns for shareholders. That would usually make a takeover bid a welcome relief. Value investing is all about identifying a company whose shares are trading on the stockmarket at a significant discount to their intrinsic value. CIMIC’s bid was very opportunistically timed, however, and we didn’t think it attributed an appropriate amount of value to the business. The bid has applied a blow torch to management and they probably have six months to prove they can generate value for shareholders before CIMIC makes another attempt. There are a few other examples where a blow torch might be necessary. Two standouts are Jumbo Interactive (JIN) and Enero (EGG). Both companies have underappreciated assets that could make them worth a lot more than their current market capitalisations. Jumbo Interactive is certainly not a holding that has hindered recent returns. The share price of the online-seller of lottery tickets is up about 40% over the last year and 70% over the last two years. It is a good business. Costs are relatively fixed and lottery players are flocking online in big numbers. With a database of more than two million customers, Jumbo’s profitable Australian business is the largest independent seller of lottery tickets in the country. And the company has just closed its business in Germany, which made a loss of $2.6m last financial year. The perennial risk is that Jumbo doesn’t run its own lotteries. It is merely an authorised retailer for Tatts Group (TTS), which has managed to buy itself a monopoly on lotteries in most states in Australia. Jumbo is an ongoing reseller of Tatts’ lotteries with no long term agreement. This means that at any time it wishes, Tatts can terminate Jumbo’s right to sell tickets. Despite all the recent positives and share price appreciation, the stock remains materially undervalued. But how undervalued? And how to extract that value? But we believe recent developments have reduced this risk. We have written about them in the October monthly report and won’t go into too much detail. But we maintain the view that the emergence of Lottoland in Australia will strengthen Jumbo’s competitive position. It improves the likelihood that a merged Tatts/Tabcorp entity will recognise the strategic value in Jumbo’s customer database and sign a long-term deal. It also sets a precedent for Jumbo to obtain its own licence and modify its business model to selling bets on domestic and overseas lotteries, should its relationship with the merged entity turn sour. Jumbo’s database of two million customers is a valuable asset. To put it in perspective, German peer and International Share Fund holding Lotto24 has 1.2m customers and a market capitalisation of $302m. Granted, Jumbo’s database is much older (the two companies have roughly the same number of active players) and Lotto24 is growing much faster, but Jumbo’s market capitalisation is just $86m. Jumbo is in a strong financial position with cash of $26m and franking credits of $10m. Yet the board has been painfully conservative when it has come to capital management. Jumbo has paid out just 34% of its earnings in dividends over the last 5 years. With the geographic expansion strategy abandoned, Jumbo is now a business with minimal capital requirements. Yet at its recent half year result, it declared a 3.5 cents per share dividend, despite earnings per share of 5.9 cents. And excluding the discontinued German business, earnings per share would have been 7.9 cents. In a normal year for jackpots, Jumbo should be able to make $9m of profit equating to 20 cents per share. Paying this to shareholders as a fully franked dividend would see the share price trade materially higher. The 2017 financial year is shaping up as a poor one for jackpots, a key driver of Jumbo’s revenue. But in a normal year for jackpots, Jumbo should be able to make $9m of profit equating to $0.20 per share. Paying this to shareholders as a fully franked dividend would see the share price trade materially higher. A $0.20 per share dividend trading on a 7% yield equates to $2.86, well above the current share price of $1.90. And it has enough franking credits to return at least $0.30 per share of excess cash in the form of a special fully franked dividend, which we don’t believe would detract from the values estimated above. We have made our thoughts clear to the board and will be taking more forceful action at the AGM if we haven’t seen progress by then. Marketing conglomerate Enero Group has been a volatile and frustrating investment in recent years. Following a near death experience under previous management, the current management team have worked tirelessly to right the ship. Progress was looking promising, with margins at the earnings before interest, tax, depreciation and amortisation level increasing from 1.4% in 2012 to 7.1% in 2016. But in the last 10 months things started to go wrong. The Brexit vote led to the depreciation of the pound, where Enero derives almost half of its revenue. This was followed by UK client timidity with the final kick in the guts being the loss of its largest client, Virgin Atlantic, which was 7% of revenue. Where does that leave things now? Trading at more than 20 times 2017’s anticipated profit, the stock looks expensive on an earnings multiple basis. But adding up the individual components of value in this business, it looks absurdly cheap. The current $1.00 share price equates to a market capitalisation of $86m. For this shareholders get $34m of cash, $22m of franking credits and a motley collection of marketing businesses that generate $110m-120m of revenue. One of them, leading global PR firm Hotwire, could be worth $40m-$50m itself. Compared to global peers, $1 per share is an absurdly low price. Enero’s peers trade on an enterprise value to revenue multiple of 1.5 to 2 times. Enterprise value refers to the total of a company’s market capitalisation and its net debt. 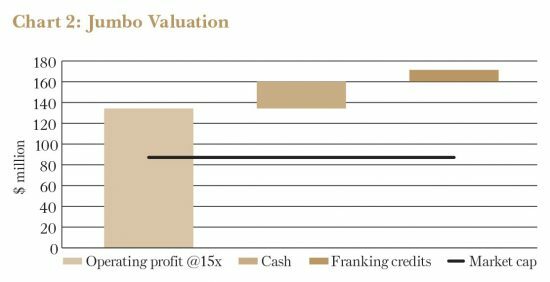 Since Enero has a net cash position, its enterprise value is just $52m. If it traded on the same multiples as its peers, its enterprise value would be up to four times larger than today. This equates to a share price north of $2.00. The only way to improve margins is to increase scale. But this could take years and involve risky acquisitions. A quicker and less risky solution would be for a global peer or private equity company to acquire Enero. It no longer makes sense for this business to be a listed company. Enero’s depressed share price is mostly a function of being sub-scale. Its operating margins before corporate costs are comparable to global peers (17% vs 20% global average). But a relatively low revenue base results in high corporate overheads as a percentage of revenue (6% vs 2% global average), which chews up a third of that operating profit. With a focus on reducing overheads in recent years, we believe there is little more that can be done to reduce corporate costs. The other main reason for Enero’s low share price is its inability to pay dividends. This relates to a historical agreement with the vendors of its acquisitions. A key contributor to Enero’s near death experience in 2010 was its large deferred consideration liability for acquisitions made. Enero underwent a restructure and capital raising with modified earnout agreements. This restricted Enero from paying dividends or buying back shares until September 2018 unless the liability had been paid back earlier. This restriction has meant Enero’s cash and unused franking credits are not being valued by shareholders. Fortunately, the deferred consideration liability is down to $5m. We believe management may be able to renegotiate the vendor agreement to bring forward the payment of dividends (presumably at a small cost). Once the restrictions are behind the company, management need to be aggressive. We estimate that the company has about $20m of excess cash (cash not required for the day to day running of the business). A special fully franked dividend of $0.23 per share plus a commitment to a high future payout ratio would keep shareholders happy while management work out how to best deal with the scale issue. Having held the stock for almost seven years, it is time to roll the sleeves up. The oil price’s stunning decline of the past four years from above US$100 per barrel to below US$50 has wreaked havoc across the oil industry globally, providing investors with a prospective place to look for cheap stocks. While internationally there were, and still are, plenty of them, we are not so lucky in Australia. The fortune of our local energy companies relies more on the price of gas than that of oil. In the Australian stockmarket, exposure to a recovery in the oil price is better attained indirectly through investing in the oil services space. 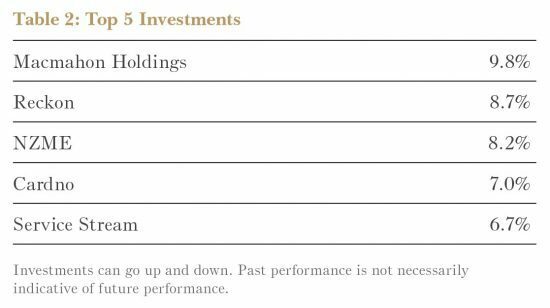 As pointed out in the January monthly report, the Fund holds four stocks that should benefit indirectly from a higher oil price. These are Cardno (CDD), GR Engineering (GNG), LogiCamms (LCM) and Matrix Composites & Engineering (MCE). The Fund also owned shares in MMA Offshore (MRM). We sold them last year, adding to the existing investment in Matrix. MMA owns a fleet of vessels that it charters to the offshore oil industry mainly in Western Australia. These vessels are used to tow and handle anchors for drill rigs, construction vessels and barges. They are also used to transport personnel and supplies to and from offshore oil platforms. At the time of the Fund’s investment in early 2015, MMA had an enterprise value of $700m and $1.3bn of tangible assets mostly in the form of relatively new vessels with an expected life of at least 20 years. While a discount to these assets was warranted due to a chronic oversupply of such type of vessels, we thought that a nearly 50% discount was too big. On the other hand, Matrix manufactures riser buoyancy systems – cylinders of plastic foam that help to keep the pipes connecting drilling vessels in position on the bottom of the sea. After the oil price collapsed, demand for new drilling ships, and consequently Matrix’s products, evaporated. The company’s order book shrunk from US$110m in December 2012 to US$22m in December 2016. 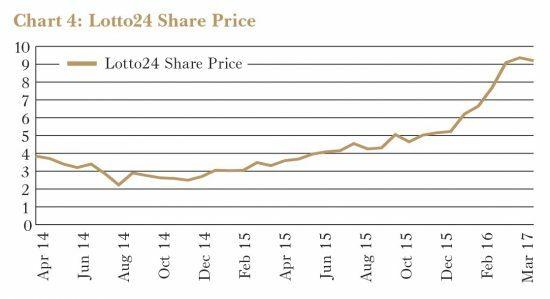 The Fund started buying Matrix shares in late 2015. The company then had an enterprise value of only $45m but tangible assets of more than $150m. The bulk of these were the result of years of investment, building the world’s largest and most efficient manufacturing facility of its kind. While the dollar value of this facility was, and still remains, tightly linked to the state of the oil market, we thought it represented a strategic asset that no competitor could justify nor afford to replicate. 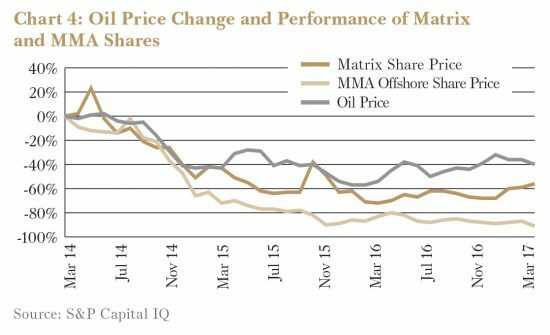 While both Matrix and MMA stand to benefit significantly from a recovery in the oil price, the risk-return profile of the two investments has diverged meaningfully. While Matrix repaid all of its debt, MMA’s financial position deteriorated. The latter failed to sell enough vessels to reduce its debt burden, which at the end of 2016 stood at $400m, four times higher than its market capitalisation. So, Matrix’s ability to wait for an oil price recovery was enhanced, while MMA’s decreased notably. Importantly too, Matrix’s management can now focus on operating its business as efficiently as possible. MMA’s management doesn’t have this luxury, faced with ongoing negotiations with bankers while trying to run a business. While we sold the shares at a significant loss, this could prove to be a good decision given its financial predicament. MMA’s failure to sell its boats at a small fraction of the price it paid only a few years ago highlighted how greatly we underestimated the level of oversupply in that market. It might be hard for MMA to earn a decent return on its discounted assets even if the industry improves meaningfully. On the other hand, Matrix’s industry has become more attractive with one of its main competitors going broke and another one losing credibility with shipyards due to quality control issues. As the last player standing, Matrix should be able to earn good returns once the industry turns. Despite these contrasting developments, the share price of both companies kept falling throughout 2016. So much so that we purchased additional shares in Matrix at a discount to even its current tangible asset backing of $0.44 per share. This price implied no value for its leading manufacturing facility or the land on which it sits. It could be a five year wait for a meaningful turnaround in Matrix’s business, but we expect it to be a worthwhile wait.